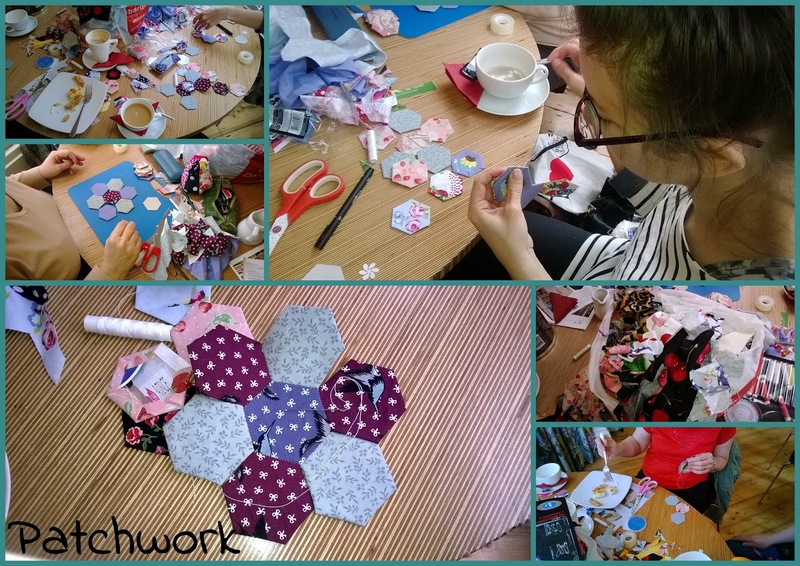 I had a fabulous time today teaching my lovely ladies how to sew patchwork. Some of them, although keen sewers and crafters had never done patchwork before, but they picked it up very quickly. I learned how to do it when I was in the 6th Form at school. One of my school friends was doing it at break time and it looked amazing. It wasn't long before a dozen or so of us were doing it too...mainly with Laura Ashley fabric. At that time you could buy bags of scraps for patchwork and other sewing projects. I wish you could buy those bags now. Though, we're fortunate that our good friend Lindsey from Violet Flamingo is at hand whenever we need the odd bag of gorgeous scrap fabric from her dressmaking studio. multi-tasking and it seems can eat pie and sew, all at the same time!! !